Halifax coach Richard Marshall has targeted a more clinical attacking performance ahead of Sunday’s second Super 8s Qualifiers fixture at Challenge Cup finalists Hull KR (3.0). 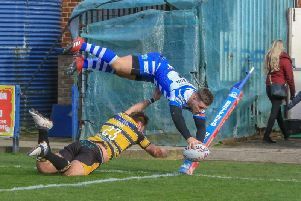 Marshall’s part-timers take on Rovers - their ‘partner’ club - who came back from 24-6 down to win at Leigh last weekend, on the back of a 14-0 home loss to another Super League side, Widnes. Fax carved out chances against the Vikings, but couldn’t take them, with Denis Betts’ side finally edging clear in the final minutes with two late tries. “Both teams made opportunities, but they took theirs and we didn’t take ours, that’s the difference between the teams. “Jacob Fairbank was nearly over the line, Mitch Cahalane was nearly over the line, Adam Tangata was nearly over the line; but we didn’t make any of them count. “The defensive stats told their own story, we made over 400 tackles for the first time this year; Widnes made 350. “Normally, we’d average 320ish in the Championship and if you make less than 300 you know you’ve had a pretty good day with the ball. “We definitely need to look after the ball better, in all areas of the field, and be more clinical when we create those opportunities. “At the same time, I think we need to defend at least as well as we did at the weekend, because they are a very dangerous attacking team. “They’ve got a great backline and a pack that has a different skillset to any we’ve faced this year; big, rangy guys with an offload game. “They’ve got Wembley coming up but that’s not a distraction for them just yet. “If anything, they’re playing for their places because I’d imagine Chris Chester still has four or five spots open for the final. Marshall’s own selection decisions hinge on the fitness of winger Tommy Saxton, who has a back injury, with Gareth Potts the likely deputy. Injured forwards Adam Robinson and Ross Divorty have both been passed fit to play. “Tommy couldn’t do much early in the week, but we’ll see how he is,” said Marshall. “He’s going to have to convince me he is 100 per cent, because it’s not something I will take a risk with.